I’ve been a bit surprised for a few days now. Some rustaceans posted two links about my spectra and luminance crates on reddit – links here and here. I didn’t really expect that: the code is public, on Github, but I don’t communicate about them that much. However, I saw interested people, and I think it’s the right time to write a blog post about some design choices. I’ll start off with luminance and I’ll speak about spectra in another blog post because I truly think spectra starts to become very interesting (I have my own shading language bundled up within, which is basically GLSL on steroids). luminance is a library that I wrote, historically, in Haskell. You can find the package here if you’re interested – careful though, it’s dying and the Rust version has completely drifted path with it. Nevertheless, when I ported the library to Rust, I imported the same “way of programming” that I had·have in Haskell – besides the allocation scheme; remember, I’m a demoscener, I do care a lot about performance, CPU usage, cache friendliness and runtime size. So the Rust luminance crate was made to be hybrid: it has the cool functional side that I imported from my Haskell codebase, and the runtime performance I wanted that I had when I wrote my two first 64k in C++11. I had to remove and work around some features that only Haskell could provide, such as higher-kinded types, type families, functional dependencies, GADTs and a few other things such as existential quantification (trait objects saved me here, even though I don’t use them that much in luminance now). The idea is that if you need to be very low-level on the graphics stack of your application, you’re likely to know what you are doing. And then, your needs will be very precise and well-defined. You might want very specific piece of code to be available, related to a very specific technology. That’s the reason why abstracting over very low-level code is not a good path to me: you need to expose as most as posssible the low-level interface. That’s the goal of luminance: exposing OpenGL’s interface in a stateless, bindless and typesafe way, with no or as minimal as possible runtime overhead. To be a typesafe, stateless and bindless OpenGL framework. To provide a friendly experience and expose as much as possible all of the OpenGL features. To be very lightweight (the target is to be able to use it without std nor core). Allocation must be explicitely stated by the user: we must avoid as much as possible to allocate things in luminance since it might become both a bottleneck and an issue to the lightweight aspect. Performance is a first priority; safety comes second. If you have a feature that can be either exclusively performant or safe, it must then be performant. Most of the current code is, for our joy, both performant and safe. However, some invariants are left around the place and you might shoot your own feet. This is an issue and some reworking must be done (along with tagging some functions and traits unsafe). No concept of backends will ever end up in luminance. If it’s decided to switch to Vulkan, the whole luminance API will and must be impacted, so that people can use Vulkan the best possible way. A bit like the first point, the code must be written in a way that the generated binary is as small as possible. Generics are not forbidden – they’re actually recommended – but things like crate dependencies are likely to be forbidden (exception for the gl dependency, of course). Windowing must not be addressed by luminance. This is crucial. As a demoscener, if I want to write a 64k with luminance, I must be able to use a library over X11 or the Windows API to setup the OpenGL context myself, set the OpenGL pointers myself, etc. This is not the typical usecase – who cares besides demosceners?! – but it’s still a good advantage since you end up with loose coupling for free. luminance has received more attention lately, and I think it’s a good thing to talk about how to use it. I’ll add examples on github and its docs.rs online documentation. I’m going to do that like a tutorial. It’s easier to read and you can test the code in the same time. Let’s render a triangle! Note: keep in mind that you need a nightly compiler to compile luminance. 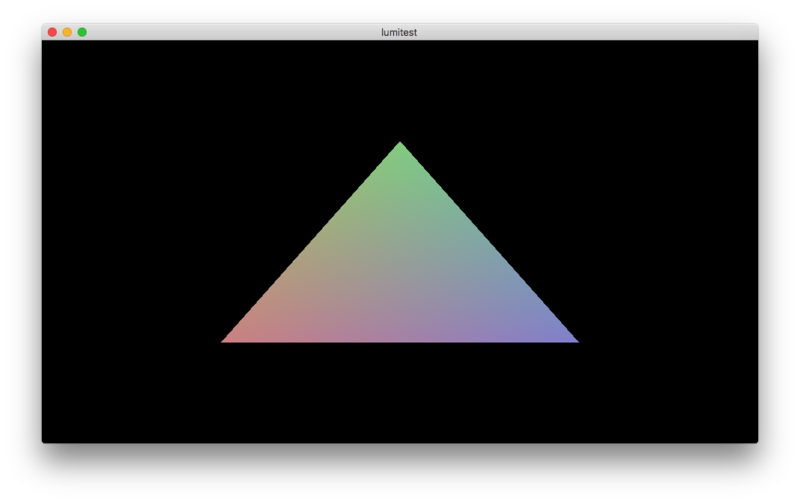 A way to open the OpenGL context; we’ll use GLFW, so the luminance-glfw crate. At the time of writing, corresponding versions are luminance-0.23.0 and luminance-glfw-0.3.2. Everything should be fine at this point. Now, let’s step in in writing some code. The main function creates a Device that is responsible in holding the windowing stuff for us. This block will catch any Device errors and will print them to stderr if there’s any. This loop runs forever and will exit if you hit the escape key or quit the application. Position, Color and Vertex define what a vertex is. In our case, we use a 2D position and a RGB color. You have a lot of choices here to define the type of your vertices. In theory, you can choose any type you want. However, it must implement the Vertex trait. Have a look at the implementors that already exist for a faster start off! Important: do not confuse between [f32; 2] and (f32, f32). The former is a single 2D vertex component. The latter is two 1D components. It’ll make a huge difference when writing shaders. This will pass the TRIANGLE_VERTS vertices to the GPU. You’re given back a triangle object. The Mode is a hint object that states how vertices must be connected to each other. TessVertices lets you slice your vertices – this is typically enjoyable when you use a mapped buffer that contains a dynamic number of vertices. Note: this is not a typical workflow. If you’re interested in shaders, have a look at how I do it in spectra. That is, hot reloading it via SPSL (Spectra Shading Language), which enables to write GLSL modules and compose them in a single file but just writing functions. The functional programming style! And we’re done for the resources. Let’s step in the actual render now. At top most, you have the pipeline function that introduces the concept of shading things to a framebuffer. Nested, you find the concept of a shader gate. That is, an object linked to its parent (pipeline) and that gives you the concept of shading things with a shader. Nested, you find the concept of rendering things. That is, can set on such nodes GPU states, such as whether you want a depth test, blending, etc. Nested, you find the concept of a tessellation gate, enabling you to render actual Tess objects. That deep nesting enables you to batch your objects on a very fine granularity. Also, notice that the functions are not about slices of Tess or hashmaps of Program. The allocation scheme is completely ignorant about how the data is traversed, which is good: you decide. If you need to borrow things on the fly in a shading gate, you can. As you can see, the code is pretty straightforward. Let’s get deeper, and let’s kick some time in! Uniforms are a good match when you want to send data to a specific shader, like a value that customizes the behavior of a shading algorithm. Because buffers are shared, you can use buffers to share data between shader, leveraging the need to pass the data to all shader by hand – you only pass the index to the buffer that contains the data. We won’t conver the buffers for this time. The UniformBuilder::unbound is a simple function that gives you any uniform you want: the resulting uniform object will just do nothing when you pass values in. It’s a way to say “— Okay, I don’t use that in the shader yet, but don’t fail, it’s not really an error”. Handy. The first one – here Vertex, our own type – is for the input of the shader program. The second one is for the output of the shader program. It’s currently not used at all by luminance by is reserved, as it will be used later for enforcing even further type safety. The third and latter is for the uniform interface. And enjoy the result! Here’s the gist that contains the whole main.rs.